A number of ISO standards cover trailer connectors, the electrical connectors between vehicles and the trailers they tow that provide a means of control for the trailers. These are listed below, with notes on significant deviations from them that can cause problems. In Europe, both 7-pin (ISO 1724) and 13-pin (ISO 11446) are common. The reason that the 13-pin exists is that the 7-pin is not able to provide all expected services. These connectors are designed for 12V, but exceptions may exist where both 6V and 24V exists. Vehicles and trailers with 6V can use the 7-pin or 5-pin connector, but these are rare today. Note that the heavy trucks that may have 12V systems are usually older (Vintage vehicles) or on non-European markets. The color coding is defined in ISO 4141-3, but the standard color codes are not always followed and may be different on your particular vehicle. Physical design of the standard ISO 11446 but also called Jaeger-connector from the company that developed it. ^ a b c Pin 3, 11 and 13 must not be joined in the trailer to avoid interaction between circuit types and over current if one ground pin isn't working. ^ a b Pin 5 and 7 must not be joined in the trailer to avoid problems in vehicles with separate circuits for left and right side. ^ Previously allocated to trailer detection in ISO 11446:2002 (the vehicle could detect it was coupled to a trailer using a link between pin 12 and pin 3 in the trailer plug). This function was removed by ISO 11446:2004 and the pin reallocated to reserved. The pin remains reserved for future allocation in ISO 11446-1:2012. Other variants of this connector exists but they are rare. One is used in 24V applications while the other is for ADR use. The difference is how they are mechanically keyed. These connectors are not very common. Physical design according to standard ISO 7638-2. This connector is intended to be used for 12V ABS and EBS on heavy duty trailers. Identified by key tab on outer ring between pin 3 and 4. ^ a b CAN bus communication according to ISO 11992. ^ a b The CAN bus is not necessary for the ABS to work which means that there are also a 5-pin variant of this connector where the CAN bus pins are excluded. Physical design according to standard ISO 1724. The 7-pin connector uses on newer trailers all 7 pins according to the ISO standard. On older trailers there's sometimes a 5-wire setup using a 7-pin connector. In these cases exclude connection for right tail light (58R) and rear fog light (54G) and connect the tail lights only to pin for left tail light (58L). Joining the pins for right and left tail lights (58R and 58L) can cause problems on German cars where it is possible to activate Standing Lamps on only one side of the vehicle. According to DIN 72552 pin 54G was initially intended for electrical control of brakes on trailers. Australia uses basically the same wiring with the exception for pin 5 and pin 2. The problematic part here is that pin 5 is used for trailer brake which means that if you for some reason connect an Australian trailer to a towing vehicle with ISO wiring you will get into trouble with the trailer brakes being applied as soon as you turn on the lights. Further reading at Trailer Connector/Australia. Physical design according to standard ISO 3732. Signals in this connector (if following the standard) are not generally legally required (local regulations may still apply), which means that it is not mandatory to connect it if it is present. This connector is basically the same as the 12N (ISO 1724) connector, but the center pin (pin 7) has changed gender to make the plug and outlet unique. Socket is replaced with pin in the plug, pin is replaced with socket in outlet. The purpose of this connector is to supplement the 12N (ISO 1724) connector for power supply of consumers common in caravans (Travel trailers). This is used in Great Britain but may also be used in other areas of Europe. There are two main variants of the wiring with a switchover date 1999. The difference is that an additional connection for ground and that battery charging in the trailer is shared with other consumers. This means that if a pre-1999 camper trailer with a battery is connected to a post 1999 vehicle there's a risk that the battery charging won't work. The combination of 12N+12S was replaced in 2008 by the 13-pin ISO 11446 connector. ^ Attention shall be paid to the fact that this pin may not be powered if the towing vehicle is manufactured after 1999 and if the trailer has a battery that is charged by the towing vehicle. The result may be that the battery wouldn't be charged as expected. The 5-pin has a design and pin layout that is identical to the 7-pin ISO 1724 connector with the exception for the lack of pin 1 (L) and pin 4 (R). This connector is sometimes present on vintage vehicles and the actual wiring may be completely different from what the standard states which means that measuring before connecting is a good idea. Whenever there is a need to change the plug or outlet it can be replaced with a 7-pin. These connectors are designated as 24 volt. Physical design according to standard ISO 12098. This connector is present on newer heavy duty commercial trucks and trailers following the ISO standard and is intended to replace the combination of connectors according to standards ISO 1185 and ISO 3731. The 15-pin connector is not designed to replace the ISO 7638 connector. ^ a b Pin 5 and 6 must not be joined in the trailer to avoid problems in vehicles with separate circuits for left and right side. ^ a b Identification lamps shall be wired to either pin 5 or 6, not both. ^ a b EBS and ABS shall be connected through the ISO 7638 connector. Notice: There was a predecessor to this connector with 13 pins that on a cursory glance is identical to the 15 pin connector but has a different arrangement of the pins. It was not very common but may exist on some vehicles and can result in an unpleasant surprise. Physical design according to standard ISO 7638-1. This connector is intended for 24V ABS and EBS on heavy duty trailers. Identified by key tab on outer ring by pin 5. ^ a b Active low, i.e. when the voltage is below +5V. Physical design according to standard ISO 1185. This connector is common on heavy duty commercial trucks and trailers but is replaced by the ISO 12098 connector on newer vehicles. ^ a b Pin 2 and 6 must not be joined in the trailer to avoid problems in vehicles with separate circuits for left and right side. ^ a b Identification lamps shall be wired to either pin 2 or 6, not both. The physical design is also used by SAE J560 with basically the same configuration. The difference is that SAE J560 uses 12V (larger wire cross-section and higher amp rating on fuses). Pin 7 may also have a different behavior on SAE J560. Physical design according to standard ISO 3731. This connector is common but on newer vehicles it is replaced by the connectors according to ISO 12098 and ISO 7638. ^ "ARTSA Voltage Troubles" (PDF). Archived from the original (PDF) on 2012-03-18. ^ a b c d e f g h i j k l "HELLA ELECTRICAL PLUG-TYPE CONNECTIONS" (PDF). ^ "13-pin 24V Trailer Connectors similar to ISO 11446" (PDF). Archived from the original (PDF) on 2012-09-17. ^ a b "ABS Troubleshooting for Trucks, Trailers, and Buses". ^ a b "ISO 1724:2003". ^ "7 pin 12N wiring diagram". 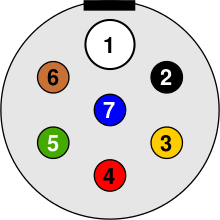 ^ "Bosch - koppling 7-polig med 5- och 7-ledarkabel" (PDF). Archived from the original (PDF) on 2013-09-27. ^ Glenning, Christer (1976). Allt om bilen. Det Bästa (Readers Digest, Sweden). p. 130. ISBN 9789170300189. ^ "The British Caravanners Club: Towing Wiring for Caravans and Trailers". ^ "Your Guide to ABS and EBS" (PDF). ^ "Just the Facts: Brake Pad Wear Sensors". ^ "13-pin 24V Trailer Connectors similar to ISO 12098" (PDF). Archived from the original (PDF) on 2013-09-21. ^ "Transatlantic connection – A comparison of different standards for trailer connectors". ^ "Truck Lite Trailer Wiring". ^ "European Truck Trailer suzie pin-out connections". This page was last edited on 25 October 2018, at 08:25 (UTC).